Global Supper Club: Ethiopian Edition was scheduled for the day after my move. 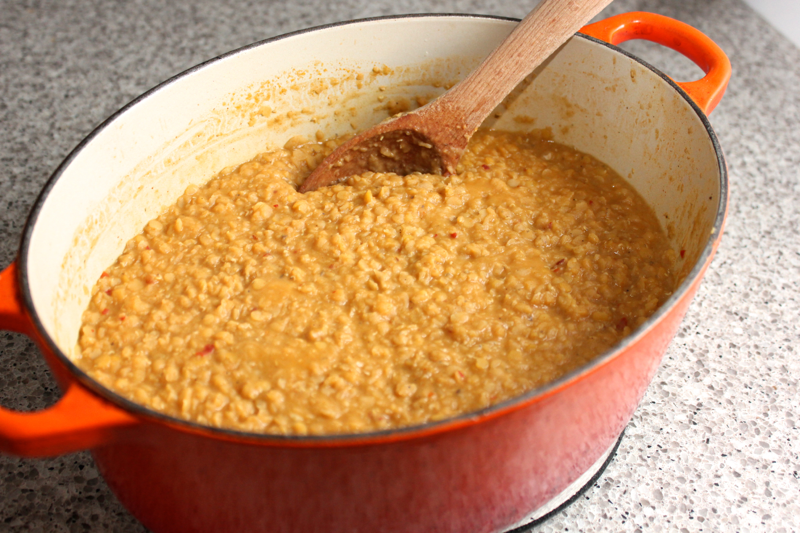 I was so looking forward to it and bought all of the ingredients I needed to make some spicy red lentils- one of my favorite Ethiopian dishes. Naturally, I forgot that I’d have to completely Stella-proof the new apartment before leaving her alone in there the next day, so attending the supper club was not realistic. Through my unending tears, I still managed to make my planned recipe a few days later. It’s not quite like the misir watt lentils I get from the Ethiopian restaurants around here, but it was still really delicious. Relatedly, there are plenty of fantastic Ethiopian restaurants to choose from in DC due to the city’s sizable Ethiopian population. Still, my favorite Ethiopian food comes from the Lily Pad on the Run food truck (my food truck post is long overdue for an update). The Ethiopian population in DC is so large, that when I had to fill out a city form asking what language I speak at home, the options went something like this: English, Spanish, French, Chinese, Korean, Vietnamese, and Amharic. David even says that, if he was to learn another language, he would choose Amharic now that he spends so much time in DC’s hospitals. To get a taste of these bright and spicy lentils, peel and roughly chop 2 medium onions, 4 garlic cloves, and a 1-inch piece of garlic. 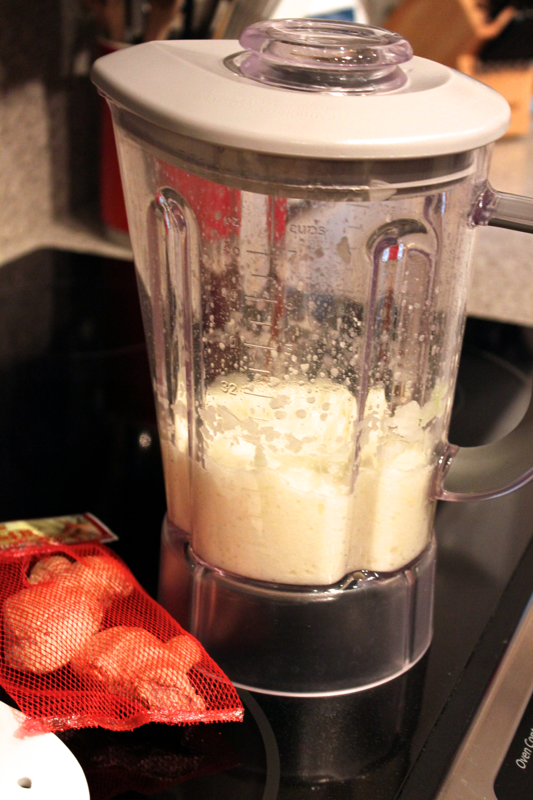 Add the ingredients to a blender along with 1 tablespoon of vegetable oil, and purée them. I don’t cook things in my blender…I’m not sure why it’s on the stove. Heat 2 tablespoons of vegetable oil in a pot, and then cook the onion mixture over medium heat for a few minutes until it breaks down even more. You’ll need to have a berbere spice mix to make these lentils, which my local spice store just began to stock. 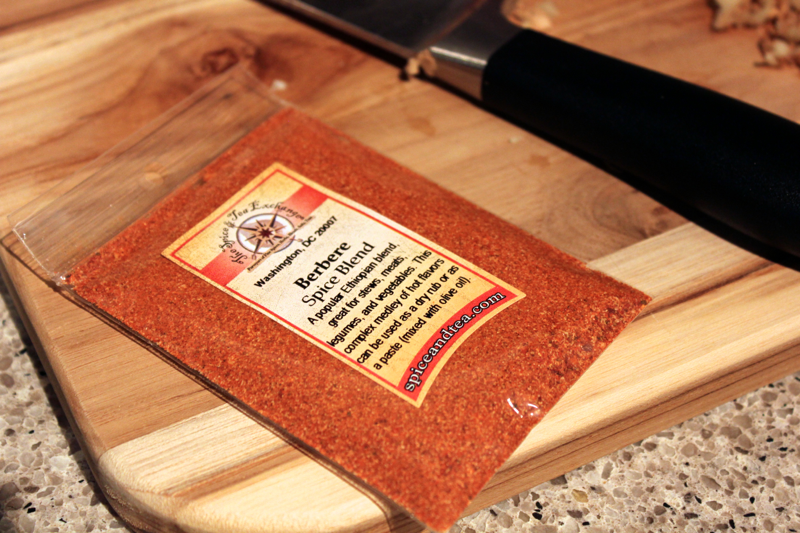 It’s a spicy mix- mine contains paprika, cayenne, onion, red pepper flakes, fenugreek, garlic, cardamom, ginger, turmeric, allspice, nutmeg, cinnamon, cumin, black pepper, cloves, and coriander. Mix 3 tablespoons of the spice mix in with the onions. The spice mixture hitting the air definitely burned the back of my throat. 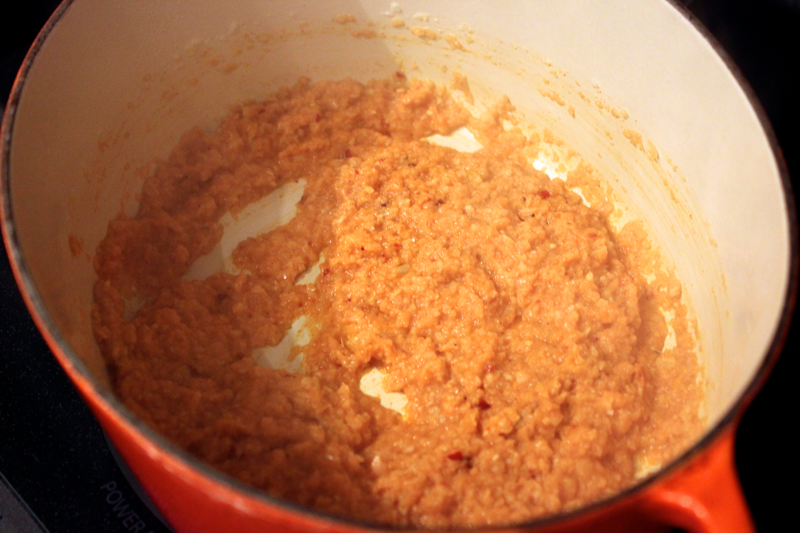 I also stirred in 2 tablespoons of tomato paste for some added depth of flavor. Pour 4 cups of chicken or vegetable stock into the pot, and stir it around. Season with salt. 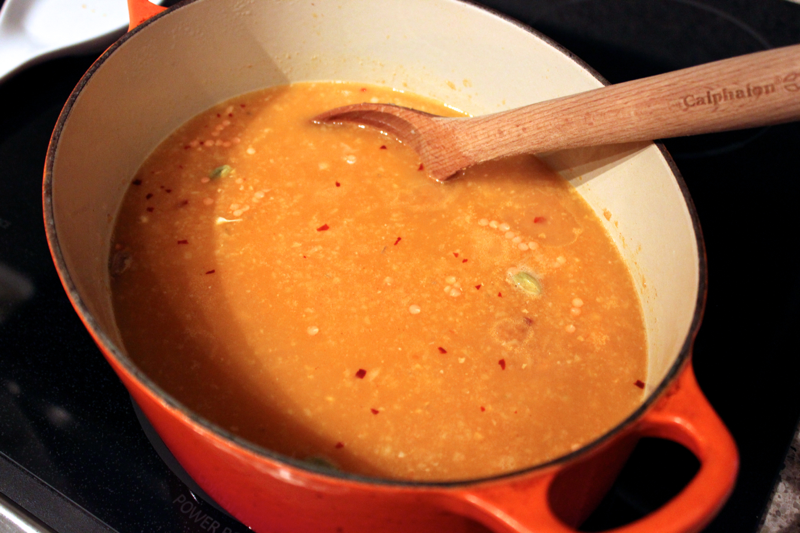 Then, stir in 1 pound of rinsed red lentils. Bring the liquid to a simmer, put a lid on the pot, and let it cook for about 20 minutes, stirring occasionally to keep the lentils from sticking to the bottom of the pot and to monitor the liquid content. Getting used to this electric cook top has been…burning me up. The lentils should have a looseish, scoopable consistency. The lentils I get from Ethiopian restaurants are not quite as thick as mine ended up, so keep in mind that they will continue thickening as they sit and cool. You can thicken the lentils by letting them simmer with the lid of the pot removed, or you can loosen them by stirring in more stock. Once the lentils are tender, taste them, and season them with additional salt, if needed. Squeeze in 1 tablespoon of lemon juice for a very needed acidic note. Serve your lentils with injera– an Ethiopian flat bread that reminds me of a very thick but airier crêpe. 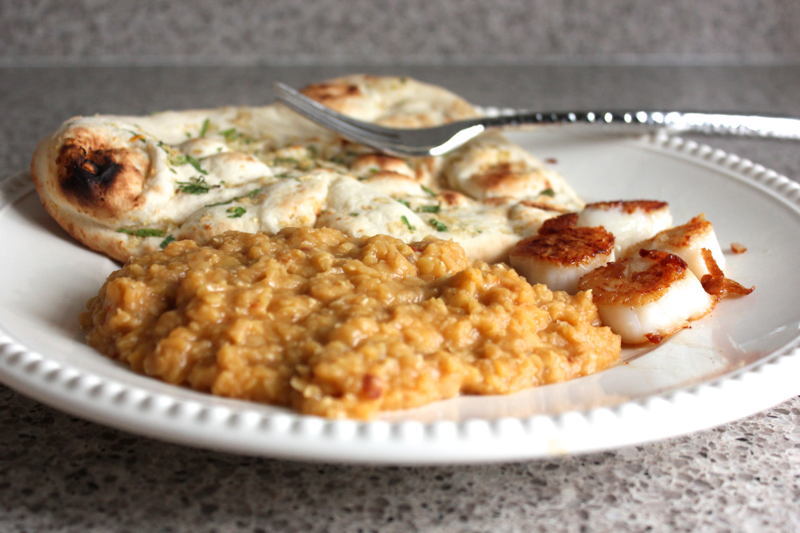 I made the lentils on a rainy day and didn’t feel like picking any injera up, so I settled for some garlic naan. 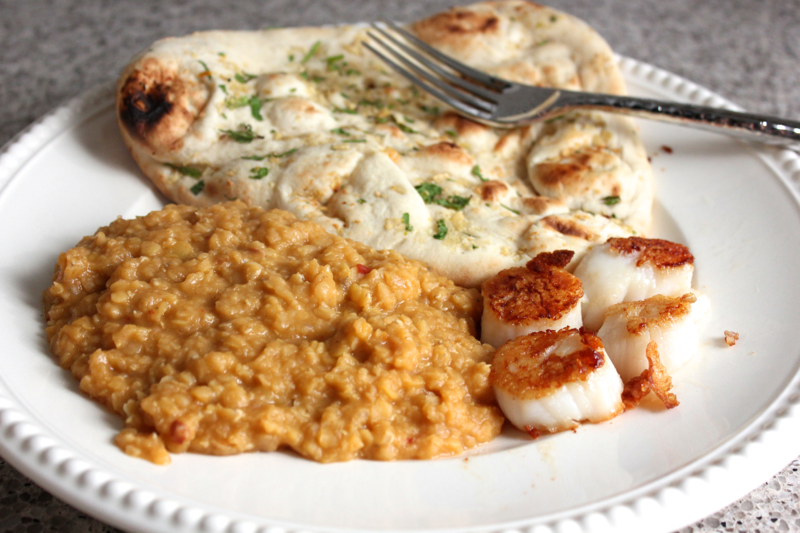 The lentils paired wonderfully with seared scallops, and we continued eating them during the week with hot dogs of all things. 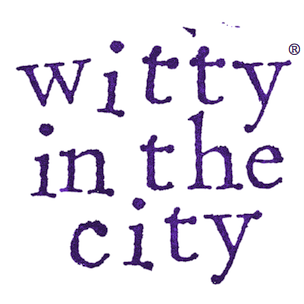 They were much more interesting than the typical baked beans! This recipe is adapted from Chef Amber Shea.